As of now, there are still about 5 arraignment dates, one of which is today, 9am. As of now, 3 misdemeanors have been filed, 4 felonies have been filed and 2 warrant letters with no court date have been sent. one says you have to surrender yourself immediately and comes with a court date (and is likely a misdemeanor); The other states intent to press charges but does not specify a court date (and is likely a felony). We are advising people to immediately get in touch with the National Lawyers Guild either way, so they can pair them together with a lawyer. If they can’t hook up with NLG, they should find a Public Defender ASAP. One of the attorneys is planning on sending a letter demanding that all confiscated property, including media, be returned and that all data copied be destroyed. If the letter doesn’t work, there will likely be some type of court action. She is also looking to speak with anyone who witnessed or was injured by the flash-bang grenades lobbed on the 30th. Another attorney is searching for folks who were arrested on felonies and had DNA collected during any of the demos. He is demanding that all DNA collected be destroyed. In general, what is happening right now is complicated. It is likely that we will continue to see a trickle of court related activity for the next month, at least. One of the attorneys noted that while fewer people have been arrested than at other mass demos in Oakland and SF, the charges have been slightly more severe. Thanks to the folks over at No Justice, No BART for putting this together. 5:30pm Crash the Public Safety Committee Hearing at City Hall. Stop the youth curfew in Oakland! When: Tue, February 10, 5:30pm – 8:30pm Where: Oakland City Hall, 1 Frank Ogawa Plaza, Oakland CA (map) Description: Policing in any form will not make our streets safe. Come to the City’s “Public Safety Committee” Meeting at City Hall, in Hearing Rm 1. Tell the OPD & city of Oakland that we need to invest in our youth not in more police, and we need to support our young people in making their own responsible decisions. Wednesday, February 11 7:00pm “Town Bizness” Townhall Meeting in West Oakland When: Wed, February 11, 7pm – 10pm Where: Black Dot Cafe, 1195 Pine St., Oakland CA (map) Description: Townhall meeting on Police Terrorism featuring: Jack Bryson, the father of two sons who were with Oscar Grant When: he was murdered by police, on New Years Day. 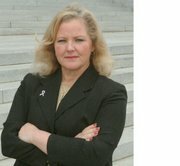 Martina Davis – The sister of Georgia deathrow inmate Troy Anthony Davis. The POCC’s Chairman Fred Hampton Jr – a former political prisoner of 9 years and son of assassinated B.P.P. leader. Randy Murphy – Black male who was paralysed by the OPD, because they thought he had some drugs, 5 years ago. Min. Keith Muhammad of the Nation of Islam – who has been a leader in the anti-police terrorism in the Bay Area movement. Hosted by the POCC’s Minister of Information JR of BlockReportRadio.com and the Associate Editor of the SF Bay View Newspaper. There will also be an update on the cases of Mehserle and other police officers involved in the murder of Oscar Grant, as well as the! cases of the Oakland 100, which includes the Minister of Information JR, who is facing a trumped up charge of felony arson. Friday, February 13 2:00pm Hearing on Gag Order For Mehserle’s Murder Trial (but no known protest planned) When: Fri, February 13, 2pm – 4pm Where: Rene C. Davidson Courthouse, 1225 Fallon St, Oakland, CA? (map) Description: Mehserle is scheduled to return to court for a hearing on a gag order that Judge Jacobson imposed last Friday. Saturday, February 14 4:30pm Town Hall Meeting (Black Clergy Initiated) When: Sat, February 14, 4:30pm – 7:00pm Where: 807 27th Street, Oakland, CA (map) Description: Town Hall Meeting at Olivet Institutional Missionary Baptist Church. Speakers from the clergy and community organizations. Focus on recalling DA Tom Orloff, taking the fight to Sacramento. Monday, February 16 5:00pm Vigil For Anita Gay, shot 1 year ago by Berkeley PD. When: Mon, February 16, 5pm – 7pm Where: Ashby BART station, MLK at Ashby, Berkeley CA (map) Description: Called by the Anita Gay Family. Anita Gay was a grandmother shot on her front porch by a lone Berkeley PD officer. Remember Gary King Jr. Jose Luis Buenrostro, Casper Banjo, Jody Woodfox, Oscar Grant, Anita Gay, and countless others. Hold Police Accountable. For more info call: 510-655-7313. Saturday, February 21 4:30pm Town Hall Meeting (Black Clergy Initiated) When: Sat, February 21, 4:30pm – 7:00pm Where: 807 27th Street, Oakland, CA (map) Description: Town Hall Meeting at Olivet Institutional Missionary Baptist Church. Speakers from the clergy and community organizations. Focus on recalling DA Tom Orloff, taking the fight to Sacramento. Monday, March 23 All day Peliminary Hearing Scheduled for Mehserle’s Murder Case (no known protest planned) When: Monday, Mar 23, 2009 Where: Rene C. Davidson Courthouse, 1225 Fallon St, Oakland, CA? (map) Description: Mehserle is scheduled to have a preliminary hearing this day, aimed at determining if there’s enough evidence to order him to stand trial. We don’t know the time and the date is probably still tentative.